After a couple of queries from people interested in this project i have decided to post an update to what we have been working on. 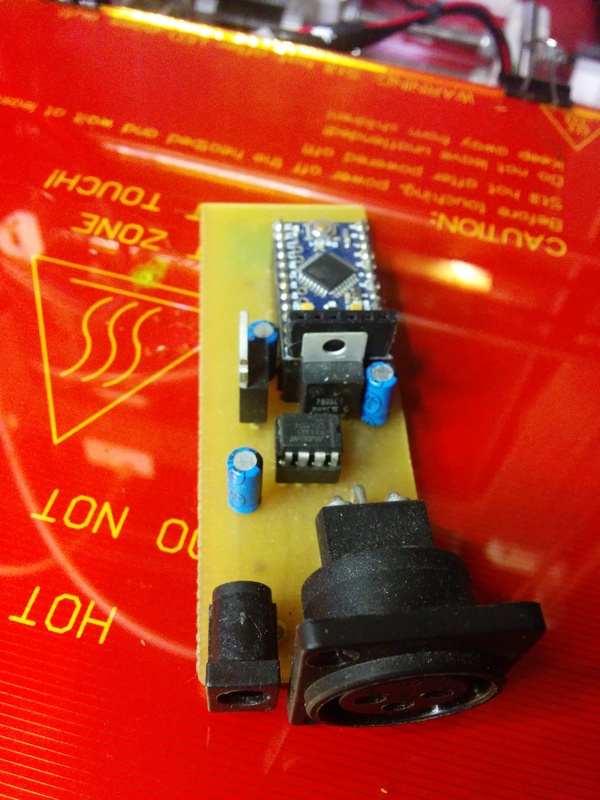 We have produced a production prototype of the Bluetooth DMX controller to bring it a step closer to being ready for a small run production sample. I also threw together a very basic Android application using MITs application inventor, this let us test the first prototype as well as show off the proof of concept to friends. There were a couple of design iterations building up to the construction of the first production prototype. The production prototype boards are based around an Arduino mini controller and a Roving Networks RN-42 SMD bluetooth module. You can see the component layout in this early design revision. from the right most side we have the XLR connector, the 8 pin MAX485 IC, the 5v regulator with capacitor above, socket layout for the arduino mini, surface mount pad layout for the RN-42 bluetooth module, 3.3v regulator, two capacitors and the 2.5mm barrel jack power connector. Note that all the thru-hole components are on the non copper side and the bluetooth SMD module is soldered straight onto the copper side of the printed circuit board. The following is the layout of the first unit built, it has the power components all to the right hand side of the board to simplify the track layout, and have both power and DMX connectors coming out the one end. For production the design is transferred to a Kinsten positive photo resist board by covering the bare circuit board with the printed design (printed on transparency paper) and exposing it to UV light, in our case using a specially designed UV flruo lightbox. After exposure the baord is still sensitive to light so it must be quickly developed in the Kinsten developer solution. Finally it is ready to etch, I did this using Ferric chloride and an old electric stove in an open area (the fumes can be quite noxious). Last two steps are to give the etched board a coat of circuit board lacquer to prevent the copper oxidising in the air and drilling out the holes for components. You can just see 4 identical circuits laid out on the large circuit board on the table. The current hardware plan is to make a small production run of units with 3d printed cases. We will give these units out to friends so we can get some feedback on what could be changed. The Android software is currently very basic, being able to only address 5 DMX channels via sliders on the touch screen. 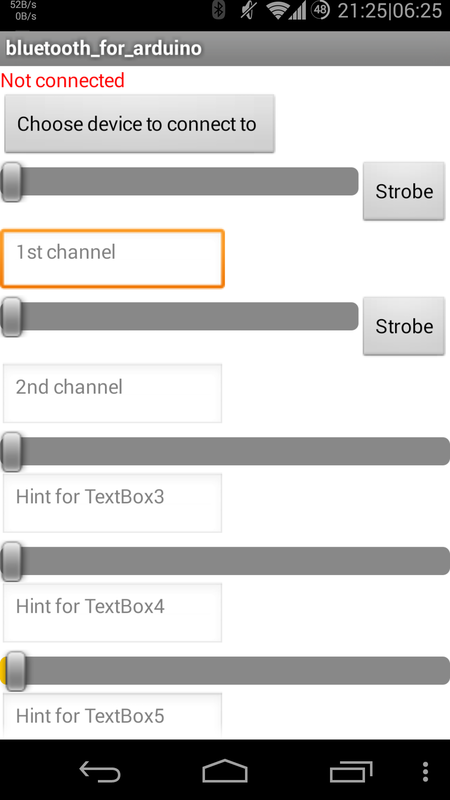 I built this quickly using the MIT app inventor, a very useful tool for quickly and easily making android applications. I set up the first 2 channels to be able to strobe between 0 and the selected value on the slider (maximum 255). I plan on re-writing the application from scratch and will be working to add the ability to assign a group of DMX channels to individual devices (like multi colour LED lights or moving heads). This will allow for a simple and intuitive interface for any screen size. Following that I will work on enabling the ability to pre-set scenes and animations to be enabled on cue or run on a pre-set timeline.This will bring the functionality of the control software to be on par or better than low end dedicated DMX lighting desks. What software do you use for PCB layout? For this I used a program called Fritzing. I would also be interested in the code for Arduino. 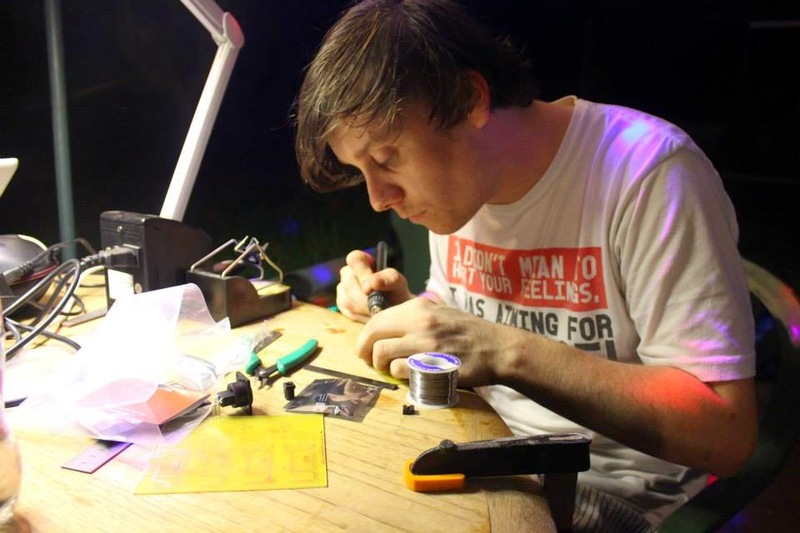 I wonder, if it would be possible with an ATTiny as well?! The code wused was the example sketch called SerialToDMX. This seems really cool and i've been looking for something like this for a very long time. I'm afraid I don't have the original design files anymore. Sorry!